The S.T.A.R. CLASSIC SERIES picket railing system offers a clean elegant look with a continuous top rail running over railing support posts below. 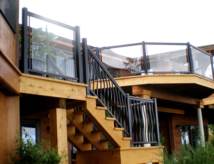 The system is constructed from sturdy architectural aluminum alloys and coated with a maintenance free powder coated finish. The system is available in both 36” & 42” rail heights with many different types of Picket and Glass options and rail designs to suit your project needs. The Classic picket railing system offers a clean elegant contemporary look for your railing application. The systems features a railing design with the support posts mounted below a continuous uninterrupted top rail. Square Pickets, Wide Pickets, and Basket Pickets are our standard Infill Options.